NVJFC are proud to announce that we have been awarded FA Community Status!!! 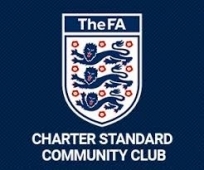 The FA Community Club scheme builds upon the foundations of the Charter Standard scheme in placing clubs at the heart of their community. Community Clubs, the pinnacle of the club development pathway, will be those that have a high quality, multi-team (minimum of 10 teams) set up with excellent social, training and playing opportunities for all. As such, the number of Community Clubs is one of the truest measures of success for The FA Football Development strategy. All new FA Community Clubs are required to meet FA criteria, ensuring they provide opportunities for players irrespective of age, gender, religion and ability. Clubs must also provide qualified coaches, first aiders and child protection officers. Becoming an FA Community club should be the ultimate goal for hundreds of clubs at grassroots level. Rob Millington says..."We should all be very proud of this and it is the result of many months of work and years of development throughout the club, It is thanks to everyone that volunteers there free time to help run our club, I would especially like to thank Ray and Dave for all the hard work they have put in to achieving this".